Includes all the existing websets at the following pages: Animals, Teddybears, Family/people, Flowers, School, Seasonal, Holidays, Miscellaneous and Miniatures. In all about 15300 unique graphics and the price is only US$150. It's a huge saving of US$1131.50 compared to purchased separately! 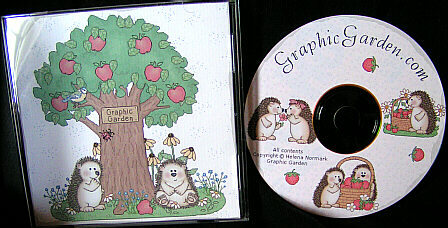 The graphics are delivered on a CD. It should arrive in 7-14 days once the order is completed. If you wish I can create links for you, so that you can download some of the sets to use while waiting for the CD. Just let me know. Important, please read! These graphics are mainly intended for website decoration. If you plan to print them, before ordering you *must* first try some free graphics (see Graphics -> Free Websets in the menu). You get the sets that are available at the time of your order. Coming sets are not included. If you want the graphics at Art4Crafts.com too or instead, feel free to ask for a price quotation. Don't hesitate to contact me if something is unclear. Delivered on CD. Estimated delivery time is 7-10 days. You can use a credit card too. After ordering, please send me an email with your postal address! SVERIGE (Plusgirot): Pris 1000 SEK. NORGE (bankkonto): Pris 850 NOK.